'The only effective defence against a suicide attack is 'pre-emptive' destruction of the attacker,' argues Colonel Anil A Athale (retd). In 1855, as troops of the East India Company massed for an attack on Tanjore, the priest to the king assured him that his mantra would stop the British. It did not and the rest is history or is it? It is worth recalling the situation that India faced in 1991. It was not merely an economic crisis, but there was also a potent security threat as well. Some evidence suggests that even our economic woes were due to the fact that we did not toe the line of the sole superpower. Many thinking Indians feared the fate that befell Baghdad (after the first Gulf War) could also be repeated in Mumbai! 'Cap, roll back and eliminate' was the constant theme of the United States as far as Indian nuclear capability was concerned. Those were the days when the sole superpower was suggesting that the affairs of the Indian sub-continent be outsourced to China. A major insurgency began in Kashmir with open encouragement from Pakistan as well as the US. The Americans were on a spree of punishing all erstwhile Soviet Union friends. In the light of these momentous changes taking place in the world there was an urgent need to review our nuclear posture of 'uncertainty' in vogue since 1974 when we tested our first nuclear weapon. But as Indians we are so fond of 'tried and tested' mantras that the Delhi elite continued to chant the theme of 'nuclear ambiguity.' Some worthies even went so far as to promote a concept of 'recessed or hidden deterrence,' a contradiction in terms since deterrence has to be by definition an open credible threat of retaliation. It cannot be hidden. It is in this situation of great national peril that the late Lieutenant General Eric Vas, a doyen of military thinkers, Major General K S Pendse and I came together and ran a campaign, both overt and covert, to convince the government of the day to reverse its policies and go for an open nuclear posture for national security. We nearly succeeded in December 1995, but our preparations for a nuclear test were detected and we had to abandon testing. This fact has been corroborated by then defence minister (and now President) Pranab Mukerjee. The reason to recall this history is to bring home the fact that in matters of nuclear strategy, there is an inherent inertia in Delhi and there is tendency to secure refuge in mantras. The reason for this state of affairs is that very few in the politico-military-bureaucratic elite have the conceptual understanding of nuclear strategy and its linkage with the logic of use of force. 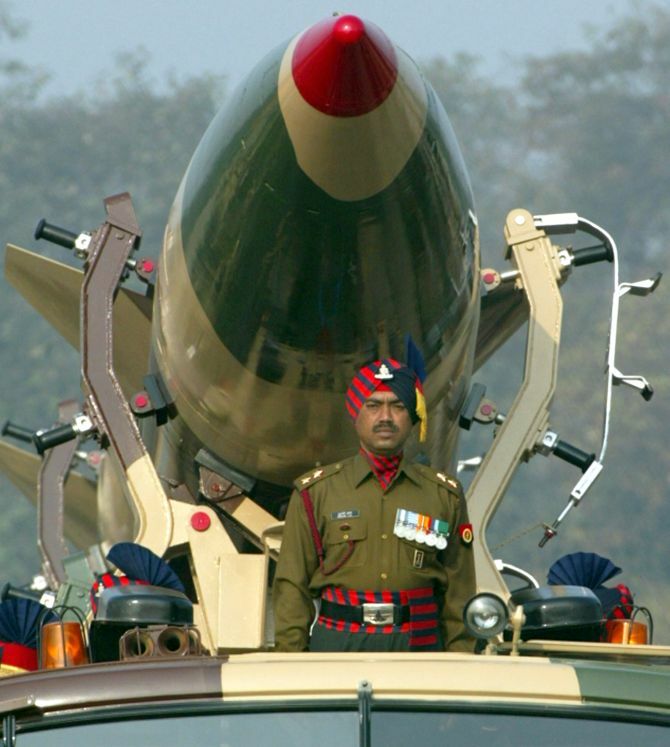 Since Pokhran II in May 1998 and the Indian embrace of nuclear weapons as part of its national security apparatus, minimum deterrence and no first use has been India's nuclear mantra. The danger of a nuclear exchange in the sub-continent is real and if we are to avoid a fate similar to that which befell the Tanjore king, it is time to jettison the mantra and get real. The reality of 2016 is that one of our adversaries, Pakistan, has dysfunctional entities (non-State actors), bordering on irrational and suicidal, who can trigger a nuclear exchange. The two-person, non-zero sum game model of the Cold War is irrelevant today. Minimum deterrence is an oxymoron. Deterrence is either effective or ineffective and is an absolute concept with no scope for minimum/maximum or partial failure/success. Nuclear deterrence is based on assured and unacceptable damage on the adversary even if we are striking second in retaliation. Assured damage capability is based on force that is survivable and fail safe as also the 'will' of the nation to act on its threat. While we indeed have the physical capability, how do we square it off with the Gandhian ethos that we claim to follow and that rejects the Biblical 'eye for an eye' concept? Both cannot coexist. Credibility is also a product of past behaviour. We failed to respond to the December 13, 2001 attack on Parliament, the July 7, 2006 Mumbai train attacks and the 26/11 attacks on Mumbai. In the pre-nuclear era, then Indian prime minister Lal Bahadur Shastri had on March 23, 1965 asserted that any attack on Kashmir would be regarded as an attack on India and India would retaliate in a manner, time and place of our choosing. Yet in September 1965, barely two days before our attack across the international border, the self-styled Pakistan Field Marshal Ayub Khan told Air Marshal Asghar Khan that he did not believe that India would attack across the international border. How do we establish the credibility of our retaliatory deterrence in light of this mindset? The second problem area is the subjective concept of 'unacceptable damage.' For us loss of half our cities is unacceptable damage so it is for China. But is it so for Pakistan? Will we be deterred from retaliation due to our humanitarian concerns, Gandhian ethos and fear of cross border radiation damage to our side of Punjab? Can an unstable and violent Pakistan be deterred by the threat to its cities? Is it time to think of producing enhanced radiation weapons to enhance our credibility? Do we need retaliatory force that is capable of completely destroying Pakistani Punjab, the political heart of the Pakistani State and its army? We have expanded our deterrence to cover all nuclear, chemical and biological attacks. How will we retaliate to a 'dirty' bomb attack on Indian population centres by a non-State actor? The dysfunctional State of Pakistan tends to resemble a suicide bomber. The only effective defence against a suicide attack is 'Pre-emptive' destruction of the attacker. Can we rule out a pre-emptive response? Will that not need a counter-force capability? These are some of the pertinent questions that need to be asked and answers found. It is time we get real. While issues like Kashmir may occupy the public mindspace for the moment, the real challenges to national security lie elsewhere. Colonel Anil A Athale (retd) is coordinator of the Pune-based Initiative for Peace and Disarmament and co-author of Nuclear Menace: The SatyaGraha Approach, 1997. Pakistan has more nukes than India! Does China's nuclear power pose a threat to India?